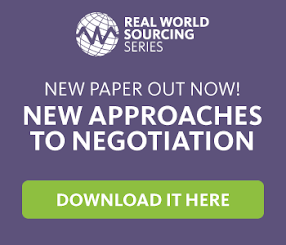 Strategic Sourcing: Procurement: On the Brink of Relevancy? While most businesses consider Procurement a necessity to purchase goods and services for the supply chain and to sustain overall internal business needs, in 65% of companies Procurement is not considered a relevant contributor to business performance and value. The good news is, on the flip side, 35% of companies are capitalising on Procurement’s relevancy by recognising it procures, sources and manages supplier relationships in a defined successful manner and that the delivery of value contribution is found in Procurement’s positive impact of Earnings Per Share (EPS), Operating Margin and Return on Invested Capital (ROIC). Procurement value contribution is extremely relevant to an organisation; unfortunately, too large a percentage of businesses do not understand the value that can be derived. With the percentage of relevancy becoming higher, Procurement appears to be on the brink of becoming extremely relevant to business.